"One of the early and most important decisions Brad Bird had to make when he started working on the script for "Ratatouille" was what to do about inter-species communication. The star of the movie is a rat after all, and much of the supporting cast is human. If you have the rat speak out-loud English with any of the human characters, you will overly challenge the audience member's willingness to suspend his disbelief. Inter-species communication is a fascinating challenge for animation. You can anthropomorphize inanimate things and animals all you want, but you have to be very careful about how you have them interact with one another, and especially with humans. In "Lion King", all of the animals had human traits and personalities, but they related only to one another. In "Finding Nemo", the fish never directly communicate with that human dentist. In "Lady and the Tramp", the animals talk to one another, but not to the humans. In "Cars", John Lasseter solved the problem by not having human drivers for the cars." This is actually a topic that I've given a lot of thought to over the years, as I believe it's something that should be considered by anybody attempting to write stories /screenplays featuring animal characters. 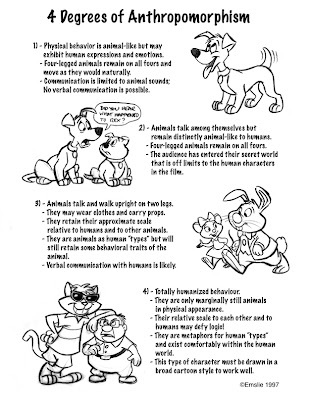 Back in 1997, the first year I taught Character Design at Sheridan College, I decided to put these observations down on paper in order to give the students something to keep in mind as they were developing animal characters that could be used in their films. Based upon all of the animated features, shorts and TV shows I'd absorbed over a lifetime of watching cartoons, I felt that one could distill the number of approaches into four main categories. This is not to imply that there are only these possibilities, by the way, as I've seen examples that are subsets of these categories, or may be oddball exceptions to all of my arbitrary rules! For instance, there may even be more than one of these categories represented within a single film. An example of this would be in Disney's "Pinocchio". Figaro the kitten is representative of the first category, as he shows some humanlike emotion while remaining very much an animal as Geppetto's pet. But then you also have Honest John the fox and Gideon who, although also a cat, is totally unlike Figaro. These two rascals are very much representative of the fourth category, in that they walk upright, talk, wear clothes, and exhibit totally humanlike behavior. In addition, they would both be human size relative to Geppetto and the other human characters. As such, these two characters are visual metaphors for human "types", the fox in particular meant to be a caricature of one who is sly and untrustworthy. Because "Pinocchio" is such an abstract, allegorical story to begin with, mixing more than one category doesn't seem to be a problem. In films that are more mainstream in their stories, I think more care needs to be taken in order to keep things clear to the viewer. So please, just take this theorizing on my part for whatever it's worth. It's really just meant to give an idea of what may be considered as characters are developed in regard to, in the words of Ed Hooks, "Inter-species Communication". Much thanks to Michael Barrier for making me aware of Ed's article. Interesting. I wonder if you have any comments on this. That's quite an exhaustive list, Perri - looks like you've covered pretty much every film and comics character in there! I'm mostly concerned with understanding the approach to anthropomorphism within a given story, leading to a set of rules that a filmmaker tries to remain true to. This handout sheet I drew up is just my way of breaking it down into four main categories, while realizing that there may be exceptions to these admittedly arbitrary rules I've set down here as a starting point to developing characters. No doubt, Anthropomorphism, or "Funny Animals", is a fascinating subject within the realm of the animated film.